I hope this blog(let) finds you doing well and enjoying your Sunday. Today we’ll try something a little different and do a short blog (Bloglet) which I will also post to YouTube for those who dislike reading. People have been telling me for years to do more video of specific subjects that are important as well as action shots of home elevations and general construction. I’m going to try and do that a lot more often since I think I’ll reach many more people than with the written word alone. Here is the You Tube link. There is a weird static thing happening for about 30 seconds, but otherwise it will save you having to read the blog. In today’s video, I’ll focus on details about the change in the codes for Coastal A zones, since that is a subject which is affecting many people. We’ll talk about how this is insanity – changing the Coastal A zone to require V zone compliance may be a pretty effective way to de-people NJ, at least in the short term. In the written blog below, we’ll repeat the Paralysis through Analysis section and try to encourage you to get past that mental stumbling block. Finally we’ll review the Nearly Famous Rebuilding Seminar which was last Wednesday night November 11th at the Tuscany Bistro Bar in Toms River. Ok, let’s roll. If You Are in the Coastal A zone and on the Fence about when to move forward – Get Started Now and Save Yourself Some Money! Get your permits before 3/15/16 or else you will be forced to raise your house on pilings, as opposed to concrete block. Evidently, I wasn’t clear enough about the urgency of this item, since a number of people have commented and complained that it is much more serious that most people know. This is because part of me does not believe we’ll be stupid enough as a state not to override this change in the building code, and the other part of me always hopes for the best and prepares for the worst. In any case, these new UCC updates will be a disaster if implemented: They’re in effect now, but we are within the 6 month grace period. They are scheduled to be mandatorily implemented on 3/15/16, but if you have your permits in by that time you are grandfathered and not subject to the new requirements. So that does all this mean to you? Essentially, the update to the UCC (uniform construction code) says that all homes in the Coastal A zone will now have to adhere to V zone construction standards. Until now, this has been a voluntary choice, as opposed to a requirement. What that means in English is that if you are in a Coastal A zone, you will not be allowed to build or elevate on concrete block, but will have to use a deep foundation system such as pilings. 2”x4” exterior walls no longer allowed – minimum 2” x 6”, with R-19 vs R13 insulation. You will be allowed to build a maximum of 300 sq ft in the flood area below the house before your flood insurance is affected. You can enclose a greater space but expect to pay a higher insurance premium. Everything on the first level is considered “sacrificial” which means FEMA won’t pay for it. If you can move your house and demolish your foundation, you can drive timber piles for your foundation structure. If you don’t have room to move your house, either on or off your property, you will now be forced to use helical piles as a foundation structure. The primary issue with helical piles is the cost. Generally, helical piles themselves are 3 times as expensive as timber, but that is not the only factor. With helicals, in addition to the actual piling itself, you need either foundation underpinning brackets (not widely used though they should be due to excellent cost savings) or a reinforced grade beam over the helical piles, which are both quite costly additions. The problem is that this additional cost will drive some people right off the edge and literally right out of town. Unless RREM refines its budgeting for homes in applicable zones to allow for increased grant awards, many Sandsters may choose to vote with their feet. Sandsters of a certain age may choose to not deal with the additional height and additional cost of elevation. Add in the fact that it’s quite costly to live here in the Garden (of Eden) State and if the new codes stay in effect, I predict we’ll see a mass exodus of Sandsters to more friendly places. Not a happy thought. If you’re in an affected zone, weigh in with your opinion at your township as well as the local office of your state legislator. If implemented, this change will be very bad for New Jersey. As always, call 732 300 5619 or email me at vince@dreamhomesltd.com with any questions. on Sandsters that are early in the process, and have not completed design work, or chosen a builder or architect. We offered engineering & architectural design advice, RREM guidance at the initial stages, and information about choosing the right builder or contractor. We spent a lot of time talking about the new code changes for Coastal A zones. We were in the Fire Room, which is an indoor/ outdoor space with a fire pit in the center. We had Kathy Dotoli, Esq., Scott Lepley, architect, and myself. Paralysis through Analysis – Don’t Miss the Forest for the Trees! : I’ve written about this many times in the past, but it is so important that I am once again mentioning it for your consideration. Simply put, don’t worry so much about getting it perfect, because you might not ever get it done. 99.44% of the time, “good enough” is more than good enough and not proceeding with a “good enough” solution will eventually yield you less of a result than just getting started with a good enough solution and adjusting as you go along. As a society, the preponderance of information has caused us to fear that a “better, stronger, faster, cheaper, smarter” solution is another click, conversation or estimate away. That mind set can cause one to spend 2.5 years evaluating a 100 day project and that is the issue that Sandsters who are stuck need to focus upon to move forward on their project. Example: Sally Sandster is obsessing over detail for her project and has spent 15 months in search of the elusive Holy Grail of Perfection. She is desperately trying to save that last 5% and is sure you can. She’s able to get estimates (finally!!) which show the cost structure she was looking for. However, in the meantime material and labor costs have risen 8%, the contractor she preferred is 5 months out and the codes have changed so she has to redo the engineering. Net savings (cost) on a $125,000 project: Negative $6500. So you can be a wizard at costing and checking and making sure of everything you can think of, and still lose money on your project. Put another way, you can be absolutely right when you walk across the road, and still get run over by a truck. Sometimes it is the “unknown, unknowns” that cause us to fail. “Ready, Fire, Aim” is another way of looking at it. Shoot, adjust your aim, shoot again, adjust for conditions, shoot again. The first shot isn’t perfect, but you are moving forward and adapting as you go. A good point to remember is that there are a number of correct solutions or courses of action in any multi-variable chaos equation, such as a home elevation project. The chances are that your choice is just fine, although inevitably in life, the grass is greener somewhere. balance somewhere between thoughtful consideration and the analysis required for astrophysical theory. That will enable you to pull the trigger and get started, with the understanding and knowledge that you will constantly adjust to changing conditions as you move through your project. If you wait to achieve theoretical “perfection”, you will never begin. RREM Update – Detailed ECR (estimated cost of repair) with pricing: From the 10-23-15 Blog…If you haven’t received this from your PM, ask for it. Go back and check the 11/1/15 blog for detail. Design work and timing: Fall / Winter 2015, Pouring concrete in the winter: If possible, you should be submitting plans to your local building department so you can lift in November or December and (ideally) have a foundation complete by the end of the year. Now is the time to make plans to secure alternate housing because there are cheap rentals in the winter at the shore. Note to Sandsters: Though I write this blog to help Sandsters, Dream Homes Ltd. and Atlantic Northeast Construction LLC are new home builders and general contractors who are actively renovating and reconstructing projects up and down the shore. We actually do all of the work that I talk about in the blog. We work with private clients and Path B clients in the RREM program. Call, text or email to set up an appointment for a free estimate on your rebuilding project. I hope this blog finds you doing well and enjoying your Sunday. Today we’ll stress about the latest FEMA insanity about changing the Coastal A zone to require V zone compliance and how it’s a pretty effective way to de-people NJ, at least in the short term. From there, we’ll talk about relative differences between builders and what constitutes the Good Guys and the Bad Guys. We’ll touch on Paralysis through Analysis and how to avoid it. Finally we’ll talk about reserving space for our next Nearly Famous Rebuilding Seminar which is Wednesday night November 11th at the Tuscany Bistro Bar in Toms River and we’ll tell you about our new satellite office in Point Pleasant on Bridge Avenue. Our next Nearly Famous seminar will be held on Wednesday, November 11th at the Tuscany Bar & Grill restaurant in Toms River, across from the Ocean County mall on Hooper Avenue. This may be the last one this year, so if you are just getting started or need some pointed advice prior to January, make your reservation now. As was the case with the last seminar, our theme will be Getting Started. We’ll focus on Sandsters that are early in the process, and have not completed design work, or chosen a builder or architect. We will continue to concentrate on engineering & architectural design advice, RREM guidance at the initial stages, and information about choosing the right builder or contractor. We will be in the Fire Room, which is an indoor/ outdoor space. We will have Kathy Dotoli, Esq., Scott Lepley, architect, and myself. It was really great to be able to have a glass of wine and some food while we talked. The room only holds 25 people so if you are interested, please call or email me to reserve your space as soon as possible. Call to Action – If You Are A Sandster on the Fence – Get Started Now to Save Money!! If you are in a Coastal A zone, get your permits before 3/15/16 or else you will be forced to raise on pilings, as opposed to concrete block. Evidently, I wasn’t clear enough about urgency, since a number of people commented. Here’s a reprint from last week, with a focus on what will happen if you don’t get your permits before March. Part of me does not believe we will be stupid enough as a state not to override this change in the building code, and the other part of me always hopes for the best and prepares for the worst. Read below. Potentially Scary Upcoming Events: New UCC updates will be a Disaster if implemented: They are in effect now, but we are within the 6 month grace period. They are scheduled to go into effect 3/15/16. What that means to all of us at the shore, is that if you are in a Coastal A zone, you will not be allowed to build or elevate on concrete block, but will have to use a deep foundation system such as pilings. There are other minor items (breakaway walls are required and concrete slabs can’t be tied into the piles or foundation structure), but the piling issue is the most important. The primary issue with helical piles is the cost. Generally, helicals themselves are 3 times as expensive as timber, but that is not the only factor. With helicals, in addition you need either foundation underpinning brackets (not widely used though they should be due to cost savings of not having to demolish the foundation and footings) or a monolithic grade beam over the helicals, which is quite costly. Unless RREM refines its budgeting for homes in applicable zones to allow for increased grant awards, many Sandsters may choose to vote with their feet. Sandsters of a certain age may choose to not deal with the additional height and additional cost of elevation. Add in the fact that it’s quite costly to live here in the Garden (of Eden) State and if the new codes stay in effect, I predict you’ll see a mass exodus of Sandsters to more friendly places. Not a happy thought. If you are in an affected zone, weigh in with your opinion at your township as well as the local office of your state legislator. If implemented, this change will be very bad for New Jersey. A few of the key people on our team have spoken to me about this recently, and I have heard it from some of our trade partners as well. It’s an observation about honesty, perspective and value and I wanted to share it, since it will help your sanity when you are rebuilding. I won’t write a book about this topic since it’s pretty simple. Essentially, we start with the theory that 95% of the folks practicing any vocation, are reasonably honest and do not attempt to steal from or defraud their fellow man. That means that at the core, unless your builder or contractor has left and closed up shop, taking your hard earned dough with him without performing any service, he or she falls into the 95% group. Those are the Good Guys and they range in quality from Grade A to Grade D, like any other trade or profession. Grade F is reserved for thieves and criminals. What does this mean? Differences of opinion between people are normal and not necessarily indicative of dishonesty. So if you are in the middle of your project, there is progress and your builder is proceeding, your project does not have mechanic’s liens and employees and subcontractors are not showing up at your home demanding payment, then the worst thing that will happen at the end is that things might not be perfectly as you would like them to be. That is infinitely better than being robbed or defrauded, or having your builder go bankrupt or be unable to complete your project due to lack of resources and knowledge. It’s a matter of perspective. 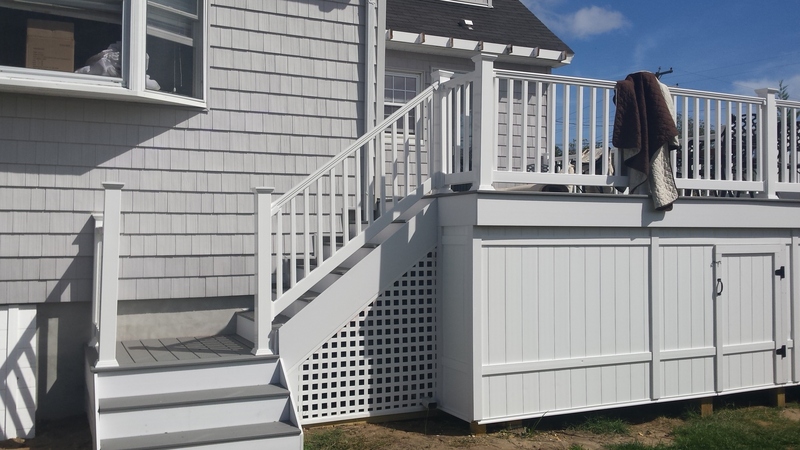 If the deck boards are not exactly as you would have liked them placed (or any other minor item), you can either pay to have it repaired or live with it. If the paint touch ups are not done correctly, it’s not the end of the world. If you call your builder and there is a disconnected announcement and the furniture is gone from their office, you have serious issues. The Moral of the Story? : 95% of the time, it can always be worse and usually much worse than you think. A good point to remember is that there are a number of correct solutions or courses of action in any multi-variable chaos equation. The chances are that your choice is just fine, although inevitably in life, the grass is greener somewhere. The salient point is not just to behave foolishly and not think at all about what you are doing, but rather to achieve a balance somewhere between thoughtful consideration and the analysis required for astrophysical theory. That will enable you to pull the trigger and get started, with the understanding and knowledge that you will constantly adjust to changing conditions as you move through your project. RREM Update – Detailed ECR (estimated cost of repair) with pricing: From the 10-23-15 Blog…If you haven’t received this from your PM, ask for it. Go back and check the last blog for detail. If possible, you should be submitting plans to your local building department so you can lift in November or December and (ideally) have a foundation complete by the end of the year. Now is the time to make plans to secure alternate housing because there are cheap rentals in the winter at the shore. MOST IMPORTANTLY: If you get your permit prior to 3/15/16, you can still build under the current regulations, which means you can add concrete block to an existing foundation, as opposed to driving pilings. See the paragraph above for details, and search the blog for many writings about foundation systems and their various attributes and costs. I’m trying to get this blog out today, and making a point to get at least a blog out each week, even if it isn’t 3500 words. Less is more, Vince…We’ll focus on the latest FEMA insanity about changing the Coastal A zone to require V zone compliance. That’s a pretty effective way to de-people NJ, at least in the short term. From there, we’ll talk about relative differences between builders and best practices for payment. We’ll touch on completion times for the average project, what you can expect and when you should be concerned. We’ll talk about reserving space for our next Nearly Famous Rebuilding Seminar which is Wednesday night November 11th at the Tuscany Bistro Bar in Toms River and we’ll tell you about our new satellite office in Point Pleasant on Bridge Avenue. 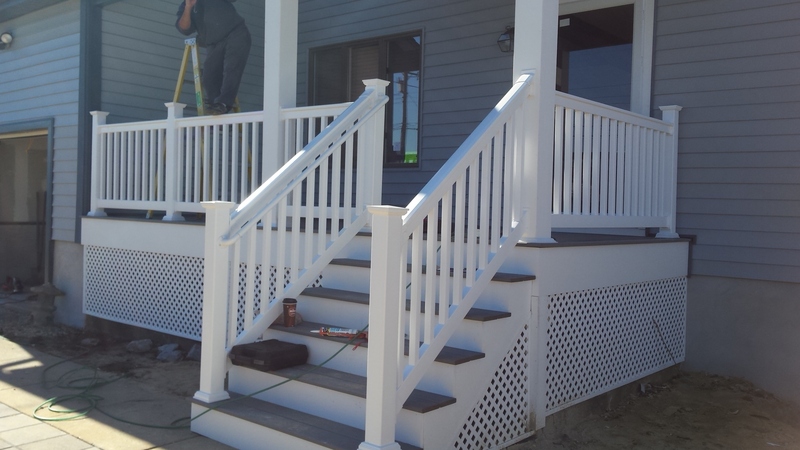 Here’s an elevated entry system we just completed in Manahawkin. 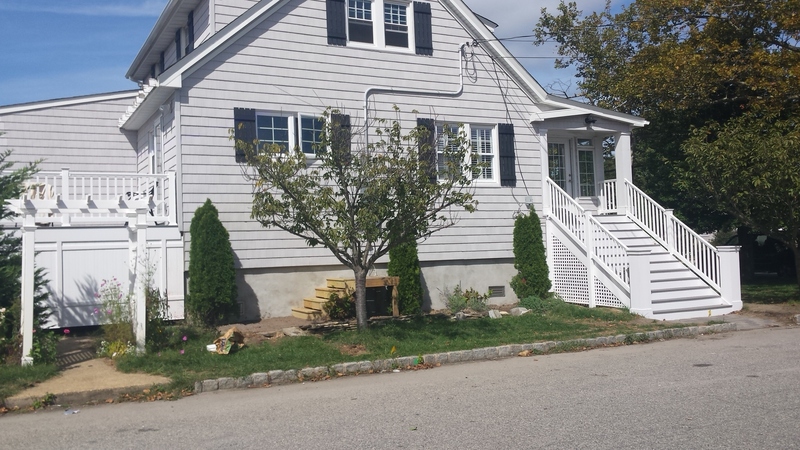 Here’s a home we just finished in Point Pleasant. Our next Nearly Famous seminar will be held on Wednesday, November 11th at the Tuscany Bar & Grill restaurant in Toms River, across from the Ocean County mall on Hooper Avenue. This may be the last one this year, so if you are just getting started or need some pointed advice prior to January, make your reservation now. As we did during the last seminar, our theme will be Getting Started, and though all are welcome, we will focus on Sandsters that are early in the process, and have not completed design work, or chosen a builder or architect. We will continue to concentrate on engineering & architectural design advice, RREM guidance at the initial stages, and information about choosing the right builder or contractor. It really helped to focus the topic for the Sandsters that are just getting started and need specific advice, and that’s where we’ll focus this time also. Building a Home Via Facebook and other insidious Social Media….Thoughts on Insanity Writ Large: Repeat from last week’s blog: Each time I write about this, I receive a number of comments, both positive and negative. I think the issue is an important one to consider, so if you didn’t read it, go back and read the 10/23/15 blog. We’ve written much about dishonest contractors taking advantage of Sandy victims and now it’s time to touch on another subject which is becoming an issue affecting progress up and down the shore. Simply put, for a variety of reasons, many homeowners are choosing not to pay their contractors. This is causing progress to slow in many places up and down the shore. Choosing to arbitrarily withhold payment for work that has been put in place and inspected, is illegal for several reasons, as well as being unethical. More importantly for any Sandsters in this situation, you are in violation of your RREM grant and can land in a world of trouble if you don’t pay your bills. Invalid Reasons to Withhold Payment for Goods and Services: You don’t like your contractor, you don’t feel like paying, or you need the money you got from RREM to go on vacation, buy new furniture, granite counter tops, or pay for a wedding. You can also not legally or ethically withhold a large payment for a small portion of your project that is not done exactly to your satisfaction. If you find yourself in this circumstance, the wise thing to do is to behave rationally and not capriciously or out of fear. Example: You owe your builder $45,000 for work that has been built and inspected, with all material and contractors having been paid. You are unhappy with how the Trex decking is finished on one portion of one of your decks, so you’ve decided not to pay any of your bill. That is not the right course of action. Solution: Get an estimate from an outside source on the cost of repair, deduct 150% of that amount from the bill and pay the balance. If the cost to repair is $1500, deduct $2250 from the $45,000 and pay $42,500. That way everyone “agrees to disagree” on the single issue and the project keeps moving. There’s plenty of time to discuss solutions and work out differences. On another note, thank God the Ocean County Prosecutor is finally, actually doing something about the many complaints made about contractor fraud. It is an absolute sin how some contractors are able to obviously defraud homeowners repeatedly, even though numerous complaints have been filed. What happened to deception and theft of services? If someone takes a deposit for goods or services and does not deliver as promised, they should be subject to arrest and prosecution. The clearer that is to anyone in this business, the less we will see Sandsters being defrauded. Remaining Sane – Repeat and continuation: No elevation project goes perfectly. It doesn’t matter how great your builder is, there will be mistakes and delays. It’s not how to avoid them happening, it is how they are dealt with when they occur. Construction is a fluid series of events which is constantly changing. Have a realistic attitude about changes and your project will go much more smoothly. See the last 2 blogs for more detail on this subject.